Ground Floor suite with patio. En-suite bathroom with bath and shower. Free Wi-Fi.King bed or twin on request. Private Family Cottage with outside patio area. Private dining room and mini kitchen. Magnificent mountain and vineyard views. Main Room with king bed and en-suit bathroom. 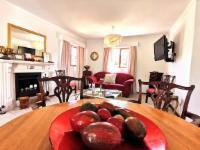 Separate upstairs open plan rooms with 2 * double beds with private bathroom. If cancelling 7 days before arrival, forfeit 100% of the booking total. If cancelling 30 days before arrival, forfeit 50% of the booking total. If cancelling 999 days before arrival, forfeit 25% of the booking total. In the event of a premature departure or no show, the full extend of the stay as originally booked and confirmed will be charged.